Climate science, theater, and civic engagement come together in an interdisciplinary setting in a new performing and media arts course that culminates in a multimedia performance this week. This Engaged Cornell project is presented in collaboration with the College of Agricultural and Life Sciences climatologist Toby Ault, assistant professor of earth and atmospheric sciences, and Ithaca-based theatre company Civic Ensemble’s Sarah K. Chalmers, “Theater and Social Change: Climate Crisis” brings together students interested in applied theater, climate change and socially engaged performance, under the instruction of PMA senior lecturer Godfrey L. Simmons, Jr., and associate professor Sara Warner. This year’s class of seven undergraduate and five graduate students are focusing on the impact that climate change has had on the Finger Lakes region. The students have a diverse background of majors, interests and theater experience. The class meets weekly in a seminar format where students read, think and discuss articles and literature about climate change, theories and practices of applied theater and works of theater history. For the first time this year, the course will culminate in a student-created “Living Newspaper” multimedia performance Dec 1, 2, 3 and 4. The living newspaper is a theatrical form that originated in Russia and gained popularity in the United States in the 1930s. The performances use direct techniques such as audience participation to encourage social change. The performance is co-directed by Chalmers and Simmons with PMA PhD student Caitlin Kane serving as co-director. The project is supported with an Engaged Curriculum Grant. Meanwhile, Mane Mehrabyan ‘17 was inspired to take the class by the opportunity to explore how theater could be used to influence social change, although climate change was not a big factor in her decision. “I didn’t sign up for it because it was about climate change” she said. “Climate change was so overwhelming for me that I had put the burden of fighting against it on others while I took up fighting racism.” Mehrabyan, who is graduating in December, says her decision to stay an extra semester was influenced by the opportunity to take this class. In addition to the scholarly research examined in the seminar, the performance is also supplemented by ethnographic information students collected as they talked with groups and individuals from around the Finger Lakes. Through the Engaged Cornell grant, community members from Civic Ensemble conducted “Story Circles,” a form of community-based dialogue, and conducted numerous one-on-one interviews with a diverse range of local residents, from scientists and skeptics to people who are for or against fracking, a controversial method of hydraulic drilling used to extract natural gas or oil. The story circle is a technique crafted by Roadside Theater, a community-based arts organization in Appalachia, intended to foster a safe and intimate space for difficult dialogues. The circles encourage deep listening, verbal expression, respect for every participant’s story and an appreciation for the cultural gifts and talents of diverse groups of people. The class used the story circle process with a variety of different groups, including Fossil Free Tompkins, Tompkins County Council of Governments Energy Committee, the town of Enfield, Boynton Middle School and Cornell scientists at Bradfield Hall. One-on-one interviews were held with community members from various backgrounds. Each student in the class was required to either attend two story circles or attend one story circle and conduct one interview. Mehrabyan says exploring climate change as a community in story circle format was important because “if we explore alone, we’ll feel overwhelmed and isolated, but in a community, we have the support of others who are going through exactly the same things we may be going through.” She says that it’s precisely the fact that climate change is overwhelming that provides an essential role for theater to talk about this issue. 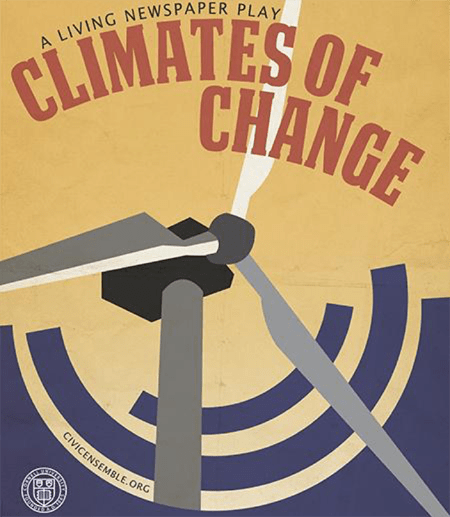 Students will perform “Climates of Change” five times across campus and Ithaca from Dec. 1-4. The 7:30 p.m. performances on Dec. 1 and 2 take place in the Schwartz Center’s Film Forum. The 2 p.m. performance on Dec. 2 is at the Enfield Valley Grange, 178 Enfield Main Road. The Dec. 3 performance is in the Martha Hamblin Hall of the Community School of Music and Arts, 330 E. State St., at 7:30 p.m. The performance on Dec. 4 is at 1 p.m. in room G10 of the Biotechnology building, as part of the Cornell Campus Sustainability Summit. All shows are free and open to the public, but space is limited. A talkback with actors, Story Circle participants, and members of the Cornell Climate Action Advisory Group will follow each performance. Directions and more details about the performances can be found here. Spencer DeRoos is a communications assistant for the College of Arts & Sciences.